Jewish deli cookies. So. Damn. Good. Butter two baking sheets and set aside. To make the cookies: In a large mixing bowl, combine the sugar and butter. Mix with mixer or hand until fluffy. Add the eggs, milk, and vanilla and lemon extracts and mix until smooth. In a medium bowl, combine the flours, baking powder, and salt and stir until mixed. Add the dry ingredients to the wet in batches, stirring well to combine. Using a soup spoon or ice cream scoop, drop spoonfuls of the dough 2 inches apart onto the prepared baking sheets. Bake until the edges begin to brown, 20 to 30 minutes. Place the confectioners’ sugar in a large bowl. Gradually add enough of the boiling water to the sugar, stirring constantly, until mixture is thick and spreadable. Remove half of the frosting to the top half of a double boiler set over simmering water and add the chocolate. Warm the mixture, stirring, until the chocolate is melted and the frosting is smooth. 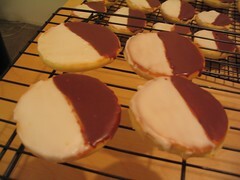 With a brush, coat half the cookie with chocolate frosting and the other half with white frosting. The chocolate frosting was a little too thick, so I thinned it out with water, adding about a quarter teaspoon at a time while stirring. I freaking love black and whites. I have yet to try my hand at baking them, I saw a mini version( martha recipe). That is on my to try list. Is this the real recipe from Zabar’s or a copycat? ?